Whether you're selling items online or just want to send a large package, our White Shipping Labels with TrueBlock® technology make shipping easy. The opaque label covers everything underneath, allowing you to re-use boxes and cartons. FSC certified labels made with paper from well-managed forests. Works well with Australia Post, PayPal, eBay and other popular shipping software. 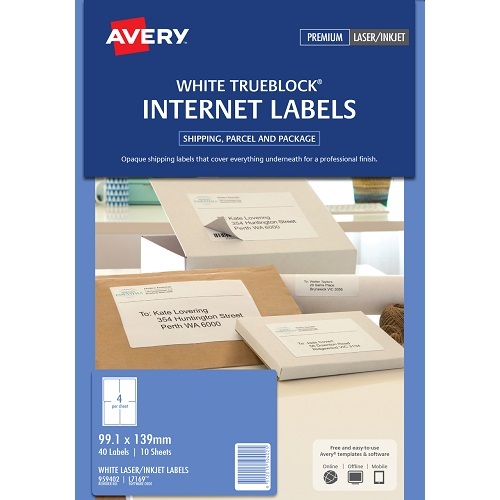 Add a professional finish to your parcels with Avery® White Internet Shipping Labels. Avery® A6 Shipping labels are ideal for printing and labelling parcels and large envelopes one at a time. A6 Size - White - Permanent adhesive.